Launched in December, 2012, MSOAC is another dynamic partnership formed to promote consensus science. Created jointly with the National Multiple Sclerosis Society, MSOAC will collect, standardize, and analyze data about MS with the goal of qualifying a new measure of disability as a primary or secondary endpoint for future trials of MS therapies. The National Multiple Sclerosis Society recognized the gap in the MS treatment pipeline and decided to employ a method that has steadily gained support within the research community — consortia science. 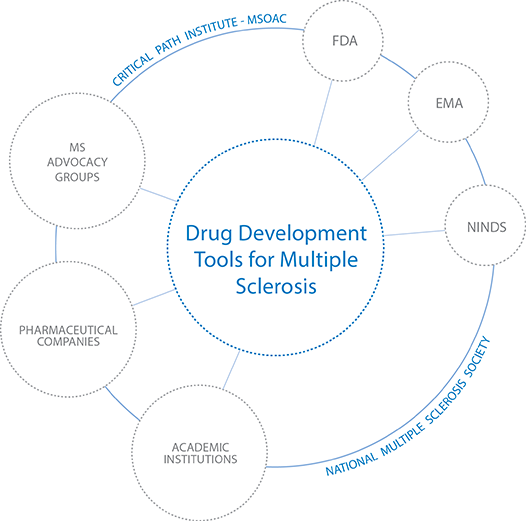 MSOAC brings stakeholders from industry, academia, MS advocacy groups, and regulatory agencies together to spur development of drug development tools to assess the effectiveness of potential treatments for all forms of MS. Placebo arms from clinical trial datasets, which were contributed by industry members of MSOAC, are aggregated in the MSOAC Placebo Database. The MSOAC Placebo Database presently includes 2465 individual patient records from 9 clinical trials. This version 1.0 includes records from relapsing-remitting, secondary progressive, and primary progressive forms of MS. The C-Path Data Collaboration Center (DCC) database contains, but is not limited to, data on demographics, medical history, performance outcome measures [e.g. Timed 25 Foot Walk (T25FW), 9-Hole Peg Test (9HPT), Paced Auditory Serial Addition Test (PASAT), Low Contrast Visual Acuity (LCVA)], clinician reported outcome measures [e.g. Expanded Disability Status Scale (EDSS)], patient reported outcome measures [e.g. 36-Item Short Form Health Survey (SF-36)], relapse information, and MS type (e.g. relapsing-remitting). The data are re-mapped to the current Clinical Data Interchange Standard Consortium (CDISC) foundational standard (SDTMIG v3.2). Knowledge of SDTM is necessary for effective interpretation of these data. All data are fully anonymized and de-identified. Also, the individual clinical trials are not identified in this pooled placebo database. The MSOAC Placebo data is available to qualified researchers who submit, and are approved for, a request for access.